Josh Horton wasn’t yet a YouTuber when the platform changed his life. As a then-high school student who’d been juggling casually since grade school, Horton found out there was a whole juggling community that congregated on YouTube to share videos of their best moves. What was more is through YouTube, he also figured out he lived close to a world-class juggler. He reached out. That’s how he got himself a mentor. Now Horton, 28, is a world-class juggler himself, sharing his own content on YouTube. For most of last year, he was gaining around 5,000 subscribers per month and netting around 1.5 million views per month for his juggling and trick shot videos. Then, in September, he and his wife Cassie appeared on Live with Kelly & Ryan (clip below), attempting to break the world record for most apples sliced while juggling knives. On air — and while juggling some very wicked-looking knives — Horton sliced 36 apples in one minute, solidly beating the previous world record of 30. 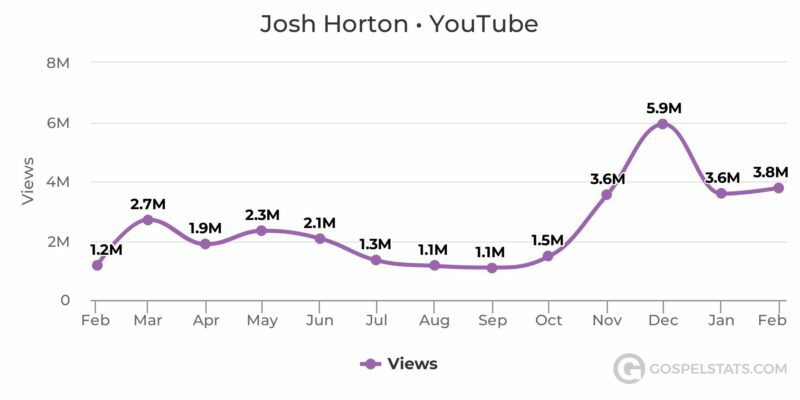 Following the segment, Horton’s YouTube channel saw a significant spike in traffic and subscribers. Nowadays, he’s bringing in between 20,000 and 30,000 new subscribers — he has a total of 364,000 — and netting 4 million views per month. He also has 343,000 followers on Instagram. 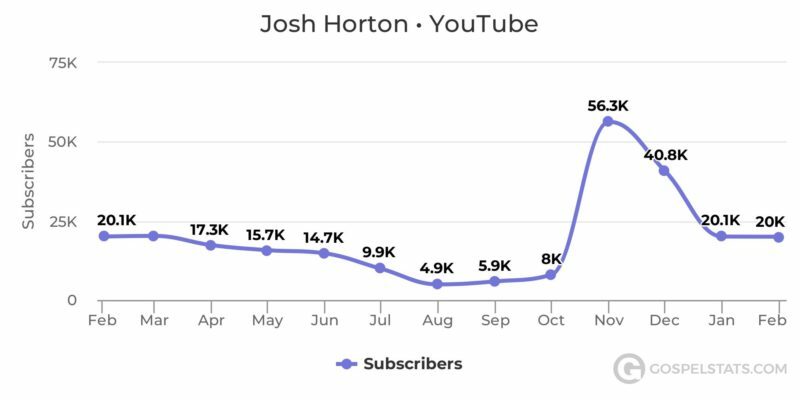 Horton’s monthly subscriber count over the past year shows a spike in November following his apple-slicing segment. We see a similar spike in his monthly view counts. And those followers aren’t just driving his social media numbers up and to right. They’re also supporting his fledgling juggling store, JugglingWarehouse.com, where he sells his own merch as well as items from a number of top juggling brands. Horton’s biggest ongoing project is his series World Record Wednesdays, where he collaborates with seriously talented folks to break new world records each week. The series has precipitated some crazy moves, like renting an actual tank, challenging a cop to prove just how good he is on the basketball court, and sacrificing quite a few baseball bats to the cause. Fresh off the best four months his channel has ever had, Horton sat down with Tubefilter to talk about how things have changed, how he intends to keep growing his channel, and what he’s going to get up to next. Tubefilter: How did you get into juggling? Tell us a little about the journey to becoming a world champion juggler. Josh Horton: My elementary/middle school in Normal, Ill., had an after-school circus program that I participated in from second to eighth grade. This taught me the basics. But this was before YouTube, so everything I had learned about juggling was from the teachers there. I had taken about a year or two off from juggling and moved to Los Angeles partway through high school, but then with the rise of YouTube, I discovered a whole world of juggling. I learned that there was one of the world’s best living nearby, and I sent him an email asking for lessons. He agreed! For the next seven or eight years, I was practicing two to five hours every single day. Tubefilter: What made you decide to take your juggling (and various other hand-eye-coordination-related talents) to YouTube? What was your goal when you started the channel? JH: For a long time, my channel was a juggling channel to share with other jugglers. This was early in the YouTube days, around 2006 or so. I only cared about filming the most difficult juggling tricks, and had no ambition of reaching a greater audience or even gathering a following. After college, I worked a “real job” while performing on the side, but wasn’t doing much juggling practice or filming. So, my YouTube channel went about four years without an upload. But when I started posting again, it was with the goal of going mainstream — creating videos anyone would enjoy. Tubefilter: How did World Record Wednesdays get started? What are some of your favorite episodes? JH: I worked on a web series with Whistle called Record Smashers, and that definitely planted the seed for World Record Wednesdays. Doing that series, I learned how fun it was to achieve something crazy like a world record. It also gave me the confidence that I’m capable of creating non-juggling or trick shot content. I had a few goals with starting World Record Wednesdays: first, creating a consistent posting schedule; second, become more than a juggler; and third, collaborate with my talented friends and other amazing creators and organizations. Some of my favorite episodes are the ones where I’m not the star. JD Anderson “The Iceman” breaking bats was one of my favorites, card throwing with Rick Smith Jr., Pool Trick Shots with Venom Trick Shots, and Dice Stacking with That’s Amazing, to name a few others. An incredible moment for me was when my wife Cassie and I were on Live with Kelly & Ryan to break the world record for most apples sliced while juggling knives! JH: May 4, 2016, is when I received my first ad revenue check after FINALLY hitting the $100 minimum. I had 250,000 Instagram followers before I had my first 10,000 on YouTube. So, I had done plenty of brand deals on Instagram, but I think my first brand deal on YouTube was with Oreo in 2017, in the early days of World Record Wednesdays. Tubefilter: Can you talk about a few of the other brand deals you’ve done for YouTube? JH: Again, I’ve done a TON of branded content on Instagram, but for YouTube, I’m starting to do more and more. Sometimes just a short plug, sometimes a fully integrated video. Oreo, Takis, SkillShare, Crayola, Air Hogs, and The Dart Zone, to name a few — some of them have come from me reaching out to them, but for the most part, I’m contacted by agencies who find my channel or find my Instagram and then see that I also have a YouTube channel! Tubefilter: We saw you recently did some videos with the Harlem Globetrotters! Can you talk a little about that experience and how you set that up? JH: YES! So fun. I’ve been in contact with them for a while and did a video with them a while back with Brodie Smith. The Globetrotters are smar — constantly traveling the world putting on shows/games and trying to sell tickets. To do that, they send a few members of the team to do promos before tour. So in addition to typical press, they also meet up with influencers like me to capture awesome content from them in exchange for promoting their shows. Tubefilter: Do you have a production budget for your videos, or for your channel overall? JH: Now that the channel is finally generating some steady and significant income, this is something I do need to sit down and figure out. But for now, I have help from Whistle taking World Record Wednesdays to the next level. They’ve partnered and invested in me to help make the series the best that it can be — helping provide resources like a cameraman and editor, and helping promote the episodes across their channels. JH: It has been a weird balance for me, and it’s hard to give an exact moment in time. I’ve always been a professional performer and still am, so I always have had that income I could depend on. But now more than ever, the performing is a side hustle for my video creation. It’s to the point where I’m having to turn down performances because it takes away from the time I need to be filming and editing. Tubefilter: What’s your production schedule like? Do you have a set filming/uploading schedule? JH: I upload to YouTube every Monday/Wednesday/Saturday. It has been this way for almost two years, and I haven’t missed an upload yet! Okay, well, once when I was on a cruise, but it went up the next day. Tubefilter: Has your success on YouTube led to any related business ventures? Do you give lessons or have a merch shop? JH: I tried doing juggling lessons online for my Patreon patrons but it didn’t work out too well, mainly because of my lack of free time to give to students. JugglingWarehouse.com is my juggling store. I launched it a little over a year ago and it has been doing really well solely because of my social media following. I’ve sold over 5,000 Josh Horton juggling balls in addition to tons of other juggling props and skill toys! 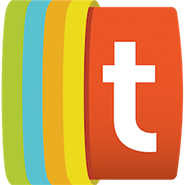 Tubefilter: How many people are on your team? Does anyone work with you behind the scenes for your channel, like an editor or assistant? What about for your JugglingWarehouse.com? JH: I’ve had a longstanding partnership with Whistle who have brought me a number of other great opportunities. I’m finally to the point where I’m hiring an editor pretty often (for five to seven videos a month). I also have someone who I pay on a monthly basis to post for me on Facebook/Twitter/TikTok/Vigo and the @JugglingWarehouse Instagram. That way I’m able to focus all of my energy on YouTube and my personal Instagram. My next hire is definitely going to be a part-time personal assistant. I love creating and I love business strategies. I hate emails, contracts, invoices, scheduling, and meetings, so need some help to keep up with everything going on! Tubefilter: Tell us a little more about Juggling Warehouse. Why did you decide to take the plunge and start a store? What’s the day-to-day running like? JH: Juggling Warehouse has been way more successful that I thought it would be. I started the store with the hopes of funding social media giveaways. 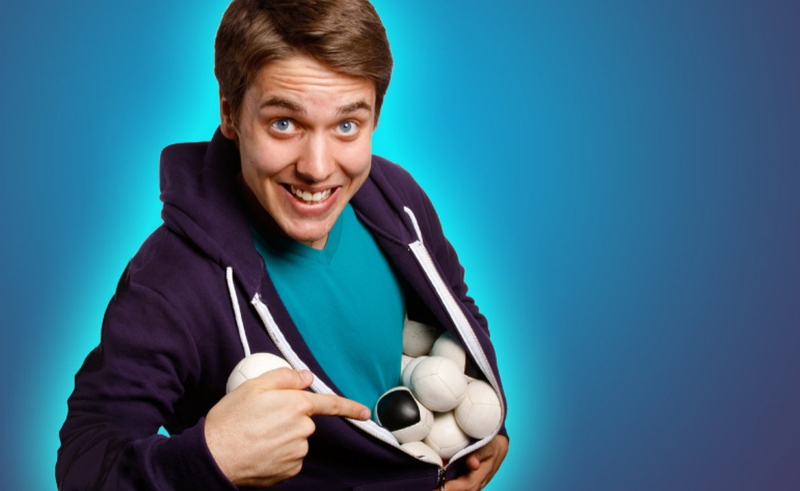 I give away a set of juggling balls every single YouTube video to someone who comments early. It encourages fans to like/comment early and have their post notifications on. I also do giveaways pretty often on Instagram. It would be really expensive without the store! To remove the curtain a little bit — I had a relationship with an existing skill toy store for many years. I pitched them the idea of duplicating their website branded as MY new store. They were on board, and the Juggling Warehouse was born. The existing store already had the employees, infrastructure, stores, and shipping setup. So it has made things SUPER easy! But because I do nothing besides push the website…I obviously don’t make as much as if I was the one investing in inventory, running to the post office, etcetera. But it’s nice to not have to worry about any of that, have them handle my giveaways, and make a little passive income. JH: I think it is the ability to both think creatively and concretely. To be a successful creator, you need to be very creative. You have to think outside of the box, constantly come up with new ideas, and create on a regular basis. At the same time, you have to be business-minded. You have to study your analytics. You have to keep up with schedules, organize emails, and negotiate brand deals. As I just mentioned, I don’t love these things and I’m hoping to hire someone to help me with them. But when you’re starting out, that’s not an option, so you have to be good at both sides or you won’t be successful! Tubefilter: What’s next for you and your channel? What are you building toward? JH: The past three months of the channel have been the best three months in the channel’s history, in all aspects — views, earnings, subscribers gained. So at this point, I have got to just keep doing what I’m doing! I think 500,000 subscribers will be here soon. And hopefully, the one million mark before too long. Both as a performer and a creator, my income has always fluctuated. I’ll have one great month and then a month with almost nothing. I think that’ll always be the case. But my goal is to keep the channel moving in the same direction so I have steady views to a point where I can count on a decent amount of income on a monthly basis even on a “slow month.” So I’m going to keep uploading, keep collaborating with other channels, and keep working hard!